At first I was a bit confused as to where the 2D to 3D conversion functionality is in the menu, but I’ve quickly discovered that it is a part of the normal Video Converter menu. If you are going to convert normal video to 3D one you just need to activate the “2D to 3D” checkbox, after you open the 2D video file and you are ready to start converting with the default settings. There are a few built in profiles that you can select from a drop down menu, so you should be able to get decent results even if you are a total novice to video conversion. 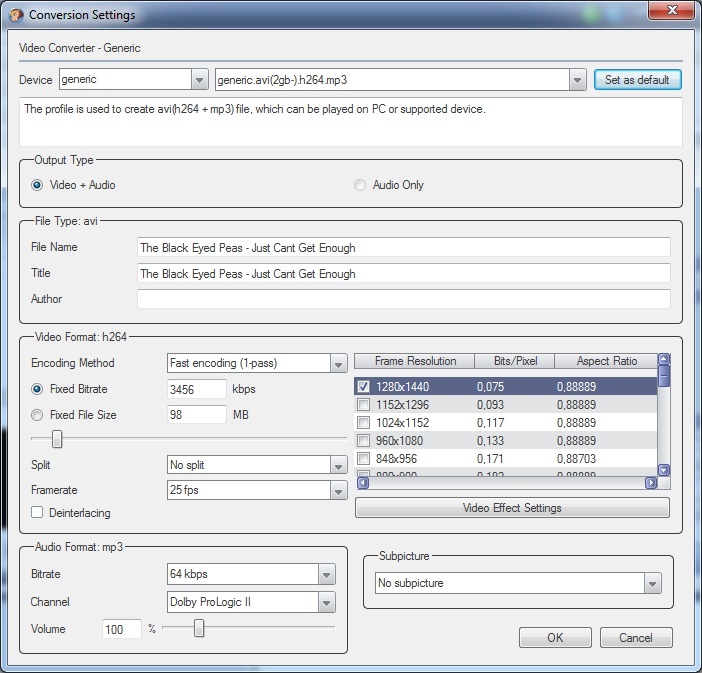 If you are a bit more advanced user you can also play with the individual settings for the codecs and formats that you want the audio and video output to be encoded in, not that much options, but all the more basic ones are there such as audio and video bitrate, output framerate adjustment, deinterlacing of the source material if interlaced etc. You can also include subtitles from an external file that will get hardcoded in the video, although that may not be such a good choice for when encoding a 3D video, even though we are talking about 2D to 3D autoconversion here. 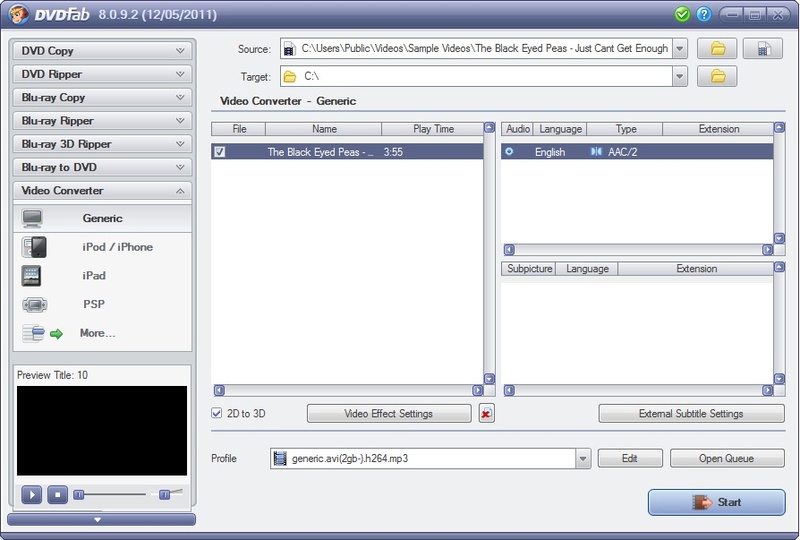 When playing back 3D video files you can also have the subtitles loaded from an external text file, at least when playing the video on a PC, but if you are playing it on another device you may want them to be a part of the encoded video. 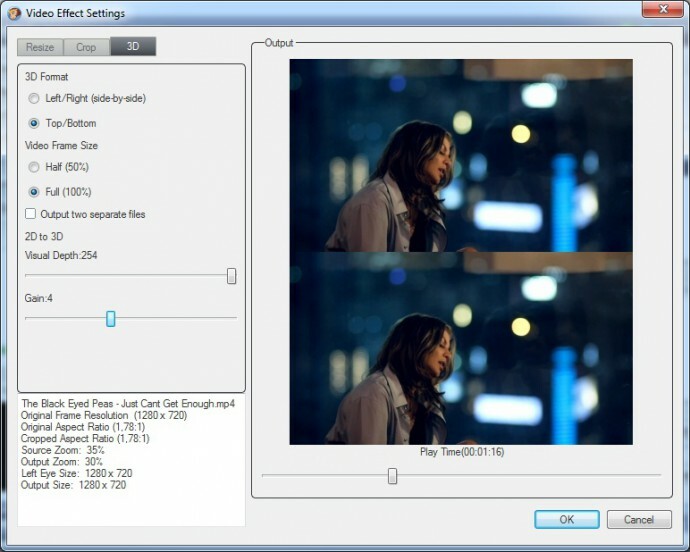 When you hit the “Video Effect Settings” button you are presented with an extra menu for more basic resizing and cropping, as well as adjusting the 3D output parameters of the output video. Of course the 3D options panel here is the most important, because from it you can choose the output format of the autoconverted 3D video. It can either be in Side by Side, Top/Bottom or into two separate video files each containing the left and right eye frames respectively. You can also choose between full frame output (original frame size) or half frame output, where you get the left and right frames with either half horizontal or half vertical resolution (squashed) in order to both fit into a common frame size such as 1920×1080 or 1280×720. The last part of the 3D menu is the most important one for the conversion, here you have two sliders where you adjust the “Visual Depth” and “Gain” of the output image, the names of these two however may not give you very clear idea on how to adjust them in order to get the best results (not well documented either). So it is up to you to play a bit with different settings in order to find what works best for each video file, the only problem is that you need to process the whole video before seeing the result, as there is no option to select just a few seconds to be processed from the whole video. So it is best to first cut a small part of the video in a video editor for testing in the 2D to 3D conversion and then load it in the DVDFab software to play with it. With this software you also get CUDA accelerated decoding and encoding on some of the video formats which can help you get faster conversion times as compared to processing only with the CPU, fo course that will only work if you have a CUDA-capable Nvidia-based video card… and a faster one. And when you are finally ready to start the conversion with anticipation to see the result in stereo 3D you are presented with a nasty and meaningless for the normal user error message. I’ve tried with quite a lot of different video files and about half of them were giving me this weird error message, although the video files play perfectly on the PC I’m doing the conversion on and they are not damaged, and the other half were converted without issues. So you may also get such problems and I was not very pleased that quite a lot of my test files gave me an error when trying to convert, if it was just one or two out of 20 it should’ve been Ok, but half… anyway, the end result after a bit of tinkering with the conversion settings was actually quite good. So what is the verdict about the DVDFab 2D to 3D Video Converter Software: quite easy to use by normal users, offers some extra features for more advanced users, has support for the basic 3D output formats, a bit limited on extra functionality that can be helpful. The lack of proper explanation about the two sliders controlling the 3D effect, the most important part of the conversion process, isn’t good at all as well as the fact that I’ve was unable to convert half of the 20 test files I’ve prepared. But the end result of the successfully converted files was actually quite good, so you may as well try to see if it will work better for you and hopefully in future releases of the software these issues will be addressed by DVDFab. Great Article on 2D TO 3D Conversion. Using DVD Fab. Hi Bloody, Could we get some 30 second Full-SBS MKV samples to see how good the 2D to 3D is? Yeah, I second that. I’d love to see how well it works. You can download and try it out, there is a trial version available on their website. Just like 3dfier and ArcSoft Sim3D. BTW, change Preview decoder to “Internal”. Helped me to avoid “nasty and meaningless” error. Does this work alright with nVidia 3D Vision? PS: That math question was HARD!! this software can not covert 2d to real 3d it only convert 2d to something that look like 3d there is no software out there to convert 2d to real 3d it toke 450 persons to convert titanic and a year to do it .